When we first arrived at the brand new house, we found one of those small railings ‘securing’ the door to the yard – eight (8′) feet below. The old phrase “Ya’ gotta watch that first step..” came to mind. 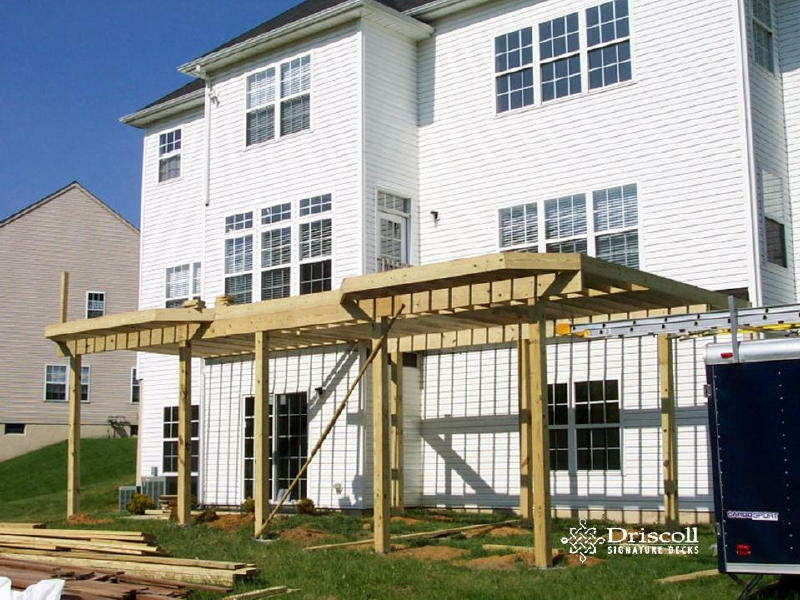 You will find quality deck designs, consultation and excellent craftsmanship when you search for Driscoll Signature Decks at Deck, Decks, Deck Builder, Deck Contractor, Decks NJ, Deck Builder NJ, Deck Contractor NJ, Wall Twsp Decks, Decks Wall Twsp NJ, Deck Wall Twsp, Deck Wall Twsp NJ Wall Twsp Decks, Wall Twsp NJ Decks Wall Twsp Deck, Wall Twsp NJ Deck, Deck Contractor, Wall Twsp, Deck Contractor Wall Twsp NJ, Wall Twsp Deck Contractor, Deck Builder Wall Twsp, Deck Builder Wall Twsp NJ, Wall Twsp Deck Builder, Wall Twsp NJ Deck Builder, Wall Twsp NJ Deck Contractor. 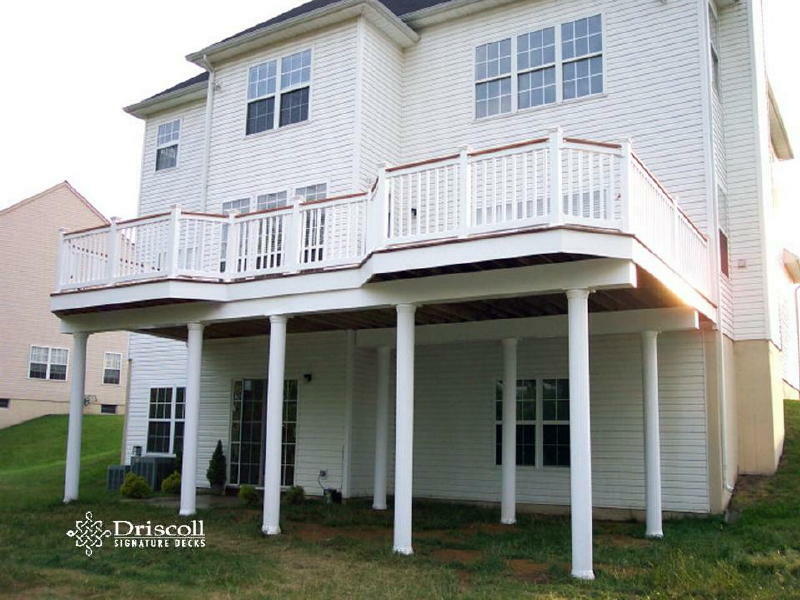 Thankfully Driscoll had a plan to safely step out of that door with this fabulous second story deck, which we designed with two eight foot cantilevered bay sections in the front. The worst thing a deck designer can do is to offer long straight runs of railings without a break or turn as we did here with these two-bay turns. 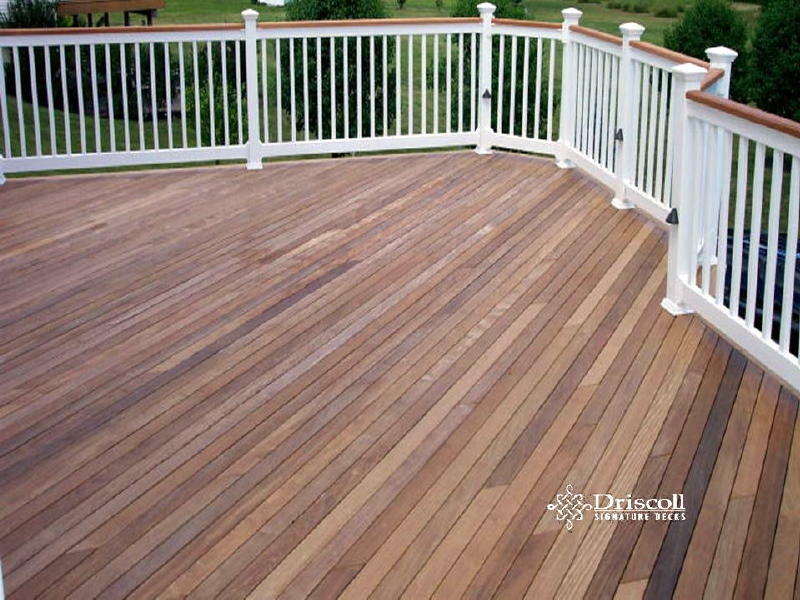 Bay turns also offer a deck it’s own unique character, a Driscoll specialty! 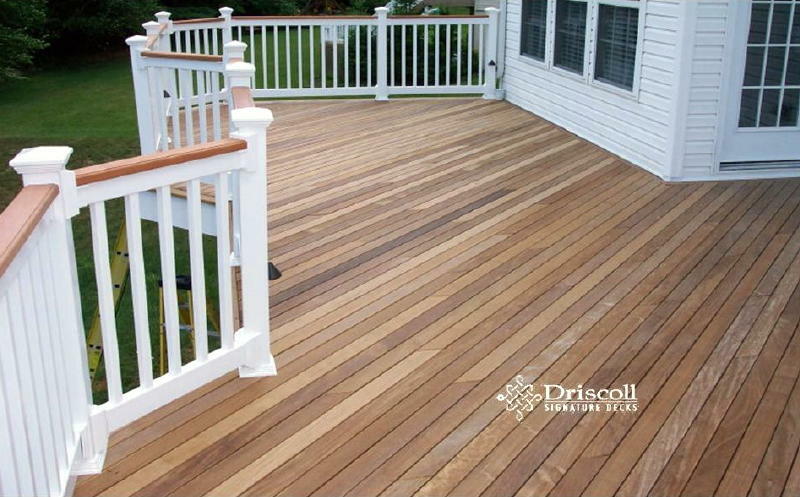 You will find quality deck designs, consultation and excellent craftsmanship when you search for Driscoll Signature Decks at Deck, Decks, Deck Builder, Deck Contractor, Decks NJ, Deck Builder NJ, Deck Contractor NJ, Wall Township Decks, Decks Wall Township NJ, Deck Wall Township, Deck Wall Township NJ Wall Township Decks, Wall Township NJ Decks Wall Township Deck, Wall Township NJ Deck, Deck Contractor, Wall Township, Deck Contractor Wall Township NJ, Wall Township Deck Contractor, Deck Builder Wall Township, Deck Builder Wall Township NJ, Wall Township Deck Builder, Wall Township NJ Deck Builder, Wall Township NJ Deck Contractor. When we install heart-wood decking like this Brazilian Ipe’, we groove the side-walls for a hidden screw clip system, this way no screws holes will show on this beautiful Ipe’ wood deck. Then we installed white vinyl railings with Spanish cedar top or hand rails, and lovo accent lights on the railing posts. 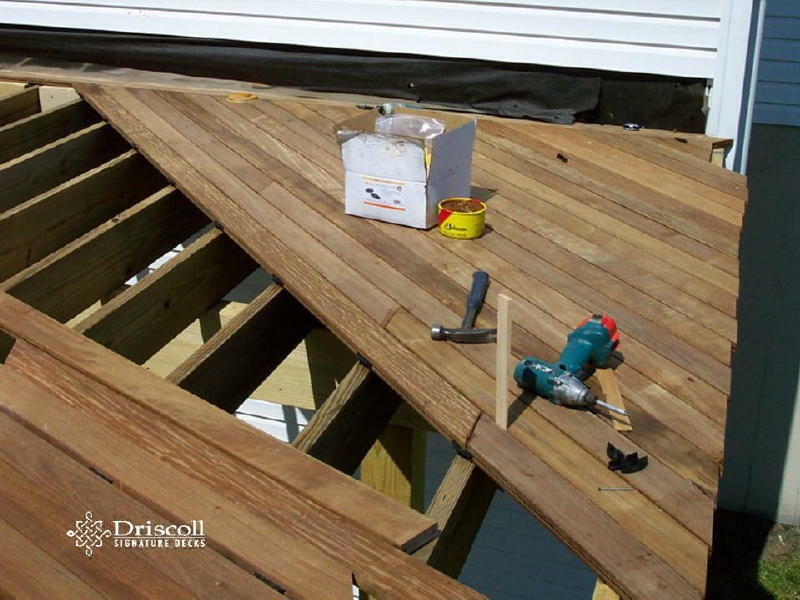 Note how the different textures and random sized boards make for a beautifully finished decking surface. 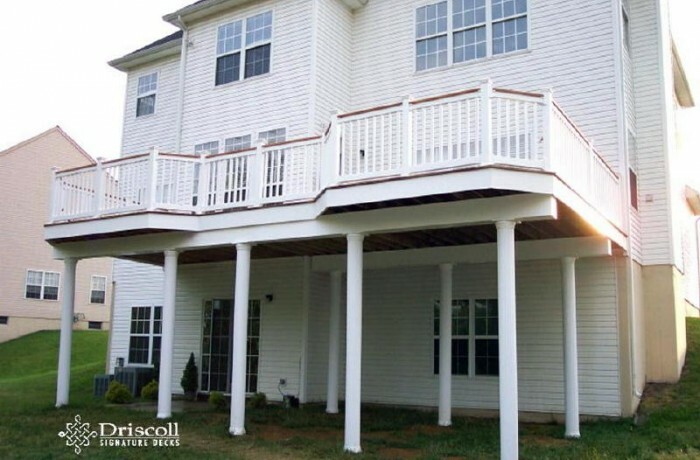 And, finally we wrapped the ‘circular’ columns and the beams in white vinyl trim for a Classic Driscoll Signature Deck look!